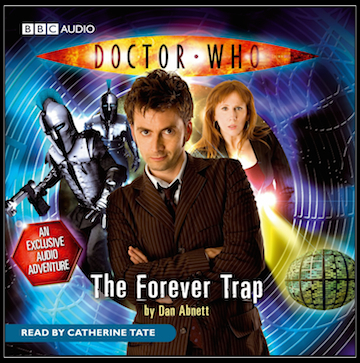 The Forever Trap is a Doctor Who story written by Dan Abnett and narrated by Catherine Tate. It is part of the New Adventure Series, published by BBC Books. The Forever Trap is an original audiobook and is not available in a printed format. The storyline revolves around the Doctor and Donna becoming inadvertent residents of The Edifice, a luxury apartment development in space, through a hard-sell approach by a holographic salesman. What appears to new residents as a well-apportioned apartment based on their specific desires devolves into danger and warfare as their time in The Edifice continues. The Doctor and Donna attempt to determine what has brought them there, and for what purpose. The author, Dan Abnett, is a British comic book writer and novelist known for his work with Marvel Comics, 2000 AD, and DC Comics, as well as for his Warhammer 40,000 novels. Dan Abnett wrote a series of Doctor Who comic stories for Doctor Who Magazine that continued during the television show’s hiatus in the early ’90s. He has written other Doctor Who publications, including the audiobook The Last Voyage (Tenth Doctor), the novel The Story of Martha (Tenth Doctor), and the novel The Silent Stars Go By (Eleventh Doctor). Abnett has also written audiobooks starring the Seventh Doctor: The Harvest and Nocture. Abenett’s Torchwood novel Border Princes was a bestseller. 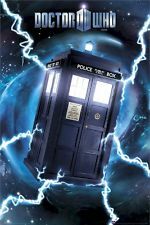 Abnett’s long history with Doctor Who is reflected in The Forever Trap when he makes allusions in the story to the Fourth Doctor, which classic series fans will enjoy. This audiobook is sparsely written, with the feel of an audio play, having limited descriptions and no internal monologues. 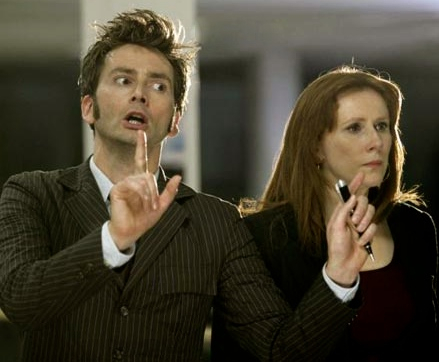 The story is not based on the point of view of either the Doctor or Donna, but plays out similarly to a television show, with the listener’s knowledge of story events and character emotions based primarily on dialogue. Abnett very effectively uses this approach to keep the story both exciting and succinct. It has the feel of a television episode, but Abnett provides enough environmental descriptions that we can use our imaginations to set the stage. Within this concise framework, Abnett provides some great character descriptions and interactions, which give the story a richness. It’s not clear if Abnett gave the audiobook its name or if the publishers did, but The Forever Trap isn’t the most memorable or descriptive title. Pretty forgettable in terms what the story is actually about. Perhaps Abnett was going to call it “The Edifice,” but then the publishers changed it when they realized that that term had already been used in the Doctor Who universe in reference to a form the TARDIS takes on in The Ancestor Cell. Even while writing this review, it’s been necessary to stop and try to remember what the name of the audiobook actually is. It’s a good story and deserves a better title. Catherine Tate, who played Donna Noble in the television series, is the narrator for the audiobook, and her skill as both an actress and comedienne contributes greatly to the quality of her narration. 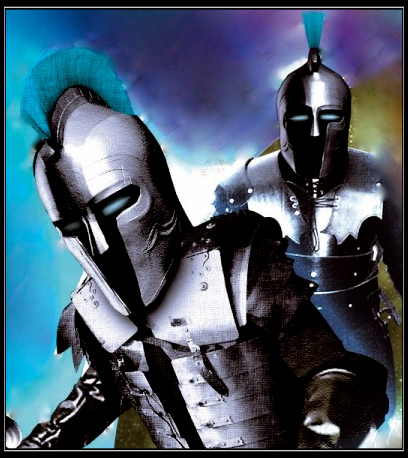 In this style of audiobook, the listener gets a lot of information from the manner in which the narrator conveys the dialogue. Through her experience as a comedienne, particularly on The Catherine Tate Show, she has developed a penchant for impressions and the vocalization of different characters. Tate’s skill lends itself to an interesting variety of voices, which helps the characters come alive. After working with David Tennant for several years, Tate has really mastered the Tenth Doctor’s speech mannerisms and intonation. For the voices of the ever-so-pushy-sales holograms and obstructionist superintendent, the accents are American, which we can only imagine is a deliberate choice on someone’s part. We really love Catherine Tate, but if you don’t like her as an actress, you might not like this audiobook. For us, she really breathes life into the story and helps us to get a sense of the chaos, despair, and anger of the many characters. Donna Noble is our favorite companion in the new series (we were quite partial to Sarah Jane Smith in the old series). Donna and the Tenth Doctor have great chemistry. One of the funny things about Donna and the Doctor from the television series was the manner in which they took offense to others assuming they were a couple. That was really played in up in The Forever Trap, as there was plenty of opportunity for it as they met the other residents in the building. One of the things that we appreciate about their relationship is that they are “best mates,” and there is no suggestion of amorous intentions as we tend to see with some of the other companions in the new series. Donna is a match for the Doctor, as she is no damsel in distress, and we see this in her determination to rescue the Doctor from dangerous situations in The Forever Trap. An upright badger in lederhosen scurried past them. It was clutching a bulging plastic sack to its chest with its paws. The sack was dripping. “Excuse me,” said Donna. The badger bared its teeth and growled at her. Donna held up her hands. “Pardon me, I’m sure,” she said. The badger shook the sack possessively. “I’m gonna kill it and then I’m gonna eat it. All mine. No shares.” “Absolutely!” agreed the Doctor. The badger sniffed, growled at them again, and hurried on its way. “We don’t want to know what it had in that sack, do we?” asked Donna. “No, we don’t,” replied the Doctor. The story has aspects reminiscent of the cantina scene in Star Wars; you don’t know what kind of unusual alien you might see next. If this audiobook were made into a television episode, it could be fantastic or it could be dreadful (depending on the quality of the special effects), but it certainly would be expensive. 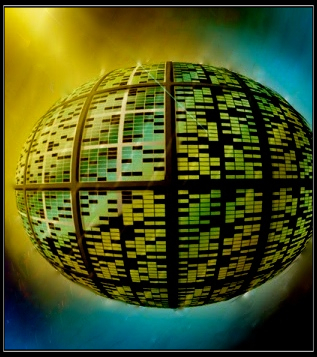 The Forever Trap is a well-crafted story that works nicely in the short audiobook-only format. The richness of the story is a result of Abnett’s characters and easy-to-follow storyline, but it is the excellent narration by Catherine Tate that really draws the listener in. The varied cast of characters provides a wider lens on the many types of aliens that exist in the Doctor Who universe than we would normally get to see. It is an excellent audiobook to enjoy on a Saturday morning or while driving in the car, and you may even find yourself enjoying it more the second time you listen to it, as we did. A two-and-a-half hour audiobook of a TV show seems like the perfect length. I would love to listen to this on a plane trip.